After Microsoft removed DVD playback function from Windows Media Player and Windows Media Center, the way to play DVD on Windows 10 is only to rip DVD for streaming with WMP and WMC on Windows 10. Speaking of DVD Ripper for Windows 10, Handbrake will be the NO.1 to enter people’s mind. Handbrake is a freeware that lets you convert various DVD into MP4 or MKV format, in which cases, you can watch DVD movies on Windows 10 based PC, Tablet, Laptop even mobile phone. However, HandBrake for Windows 10 is somehow incompatible, after upgrading to Windows 10, some users run into the problem that this free DVD Ripper software cannot running or open on Windows 10, or even annoyed by its extremely slow conversion process, “taking longer to complete than the clip took to run”. Moreover, nearly all free DVD ripper including Handbrake cannot rip copy-protected DVDs. 2. Quality & Speed：Pavtube ByteCopy is much faster than HandBrake in movie loading, title scanning, ripping, etc. And it offers high quality in converted DVD movies. 3. Input: HandBrake supports DVD (only non-protected DVDs, not even CSS encrypted DVDs), Blu-ray (Blu-ray disc structure), video file, video folder. 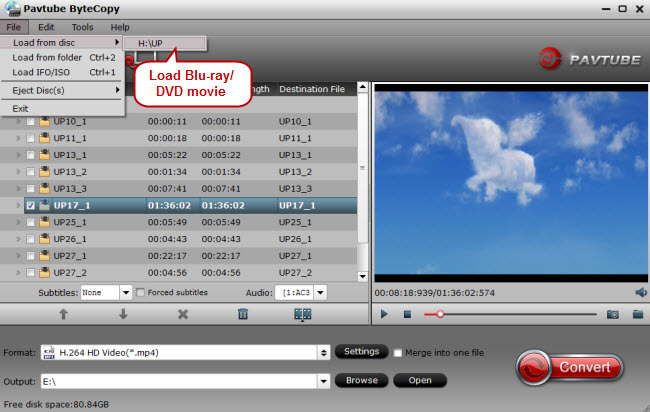 Pavtube ByteCopy supports DVD, DVD folder, DVD ISO/IFO files (any DVDs with region code, CSS, Sony ARccOS, UOPs, APS, RCE, etc) and any commercial Blu-ray encoded with AACS, BD+ up to MKB v61. 4. Output: HandBrake outputs MP4, MKV (But it defaults the output file extension as M4V not MP4) and offers universal device presets, iPod, iPhone, iPad, Apple TV (2/3), Android, Windows Phone 8. While, Pavtube ByteCopy can rips the latest protected DVDs to MP4/H.264, H.265, M3U8, MOV, MKV, FLV, MPEG, AVI, etc. and even 3D videos. When getting the hang of it, you will find it faultlessly convert all DVDs to iPhone 7/6 Plus, iPad Pro/Air 3/Mini 5, Apple TV 5/4, Android, Samsung Galaxy Note 7, PS4 Pro, Xbox One S, etc. Specially, Pavtube ByteCopy can rip DVD to lossless/uncompressed MKV and convert DVD to mp4/avi/mov with multiple subtitle and audio tracks. 5. Usability (incl. 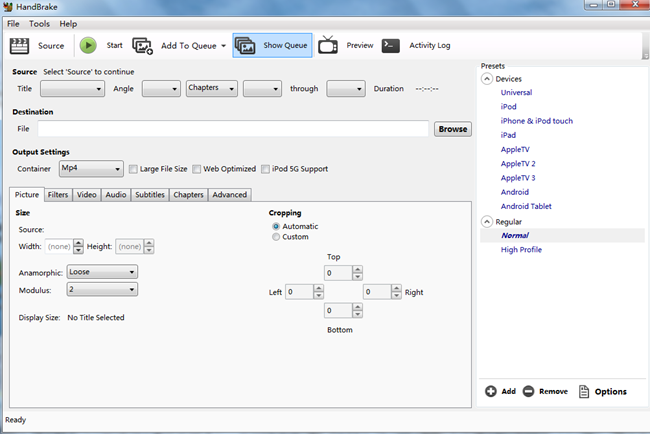 Profile Settings): Handbrake allows more personal settings and provides numerous video and audio parameter settings for advanced users to alter the file size and video quality accordingly. But it also acquires the right codecs to be installed for the type of file you wish to convert however such as DivX, Xvid, OGM, 3ivx, etc. With Pavtube ByteCopy, you can freely adjust codec, aspect ratio, bit rate, frame rate, sample rate and audio channel in the interface according to your needs and optimize the output file quality. Therefore, if you are not so professional in DVD ripping and need to decode DVD video on Windows 10, or want to make more personal profile settings, Pavtube ByteCopy may suit you better and worth your trying. Compared with HandBrake, it is easier to use, with more Windows-style UI, and is faster in converting DVDs, besides, it is in favor of newly encrypted DVDs with rich profiles to meet the needs of increasing users. Click on “Format” bar, and select output format from the drop-down list. You can choose some popular video format like MP4, MOV, AVI, WMV, etc from “Common Video” or "HD Video" list. For portable devices, special output formats are listed for you, such as Android, iPad, iPhone, Samsung, Asus, Apple TV and so on. 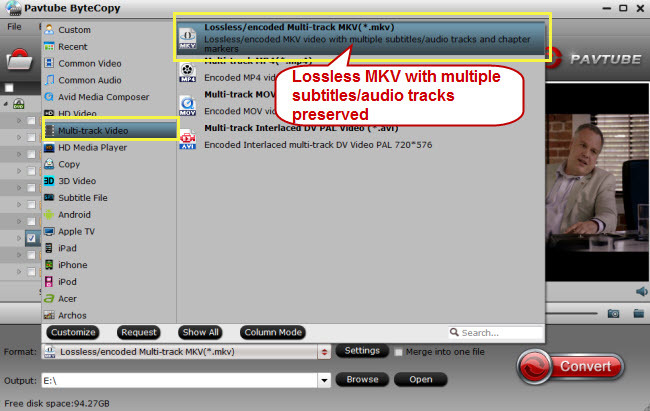 For lossless quality, please choose lossless MKV format. After finishing all the necessary settings and editing, you can click the big Convert button to start converting your DVD on Windows 10 with the best Handbrake alternative. When the conversion done, click Open button to get the ripped videos for much more convenient playback anytime anywhere or move the DVD rips to iPhone 7, Samsung Galaxy Note 7 for watching on the go. I have several movies (DVD & Bly-ray) and TV series that I ripped to put on a media server. I searched on internet , then find ByteCopy product that worked the way. I needed a tool to rip multi-track karaoke DVDs that I have for streaming at home. Pavtube ByteCopy can do that. Pavtube ByteCopy is quite practical and simple to use. I rip my own Blu Rays and DVDs to store them on my NAS.